At some shows, club members present demonstrations of modeling techniques for their fellow modelers who are visiting during the shows. For several years, these demonstrations were done on whatever module had the least scenery on it. While this worked for a while, it was not the ideal situation. Those modules had trains running through while the demonstrations were in progress. This limited the space available for the demonstration, distracted from the demonstration, and allowed items being used during the demonstration to potentially interfere with the smooth running of the trains. By adding a second deck above the main line track, the demonstration space is separated from the trains that are "just passing through" and also moves the presentation closer to eye level for most people. In addition, in between the "officially-scheduled" presentations, this space can be used for repairs and maintenance of locomotives and cars, allowing visitors to see how these operations are done, instead of having a club member working on the cars behind a backdrop. This lets us talk with visitors, and discuss ideas, problems, and solutions. This hobby is about people, not just trains. We should be able to help each other and learn from each other. Usually, a sign on top of this module will announce the next event, but if there is no sign there, please ask one of the club members about upcoming events. If you have any specific questions or suggestions, please talk to a club member. We may not have all the answers, but we may be able to find an answer, and learn something new in the process! Diagram showing the general arrangement of the upper level of this module. 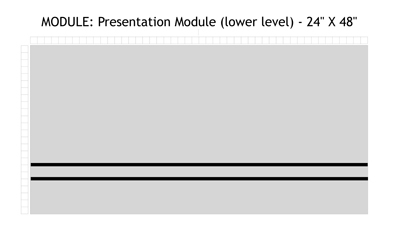 Diagram showing the general arrangement of the lower level of this module. The Presentation module, as seen from the "public" side of the module. The tracks allow model railroad cars and locomotives to be tested. The flat areas provide space for working on models. 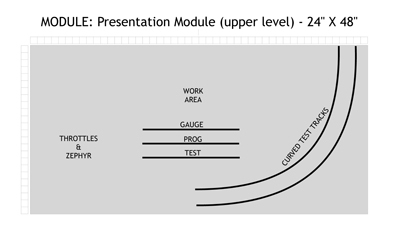 The Presentation module, as seen from the presenter's point of view. The shelf below provides storage for tools and parts.